Wife just came from Colonial Heights Library and reports that the branch will be closed July 23-September 23 for remodeling. With the Sac Library hours cuts that started last week, this really puts a damper in library hours as this was one of the only branches open until 8pm three nights a week. However the library had apparently not had a revamp since it opened in 1986. I wouldn’t say it was desperate for an update–it was just sort of a serviceable “your library here” look. Unless of course they are updating the exterior entrance pictured above which really shows its age. But the children’s section at Colonial has already gotten a refresh and it is looking really nice. 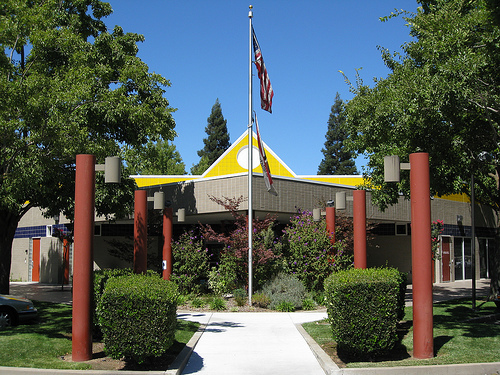 The Sacramento Public Library welcomes the public to fun, free, and exciting program at its Colonial Heights branch, 4799 Stockton Boulevard, Sacramento. For more information, please visit http://www.saclibrary.org or call (916) 264-2920. Wednesday, July 13, at 4 p.m.: Games of the World (School-Age Program). Kids ages 5 to 12 can challenge others in friendly games, including Chinese Checkers, Mancala, Go, Parcheesi, Nine Men’s Morris, Pick Up Sticks, Checkers and Chess. Tuesday, July 19, at 4 p.m.: Computer Class: Creating a Personal Email Account (Adult Program). Wednesday, July 20, at 4 p.m.: Manga Cafe with Chinese Lantern Making (Teen Program). Teens are invited to drop by the library branch for manga, snacks, anime, and making Chinese lanterns. Thursday, July 21, from 4 p.m. to 7 p.m.: Art Walk (Family Program). The entire family will enjoy a variety of activities, including live music, art displays, craft making, and free refreshment. The program is sponsored by South Sacramento Youth Leadership Council. From my experience using saclibrary.org it will probably take more time to register for the class than to register for an email account. It’s doesn’t take a website to start up a mean game of Nine Menâ€™s Morris! CoolDMZ – we know the closure of the Colonial Heights branch is a huge inconvenience for our patrons, but we’re really excited about giving the branch a facelift that will make it so much more enjoyable to use. Although hours at the Central Library have changed already due to the budget cutbacks, hours at other libraries have not yet been adjusted. We encourage you to check out some of our nearby branches, especially Southgate (with a great area for pre- and early readers), which is open on Tuesdays and Wednesdays from noon to 8 p.m.; Arden-Dimick, which is open Mondays and Wednesdays from noon to 8 p.m.; and Martin Luther King, Jr., which is open Mondays and Thursdays from noon to 8 p.m.
You can also let us know what’s most important to you about library services at one of three community forums this week: Wednesday, July 13 at McKinley Library from 6:30 to 8 p.m.; Thursday, July 14 at North Natomas Library from 6:30 to 8 p.m.; and Saturday, July 16 at Southgate Library from 10:30 a.m. to noon. The input we receive from the community will help us formulate the best way to utilize limited resources, including hours of service at all of our library branches. Any changes to hours will be implemented in late September/early October. Thanks for the comment, Brenda. I’m excited to see the updated branch as well! We have been to pretty much every branch at least once (OK, not Isleton) but the children’s section at Colonial is really great. I call foul on this whole thing. I’m an active member of the neighborhood association and our meetings are held at the library every month. We just spent weeks working out new arrangements for space for the upcoming months due to the inactivity of the previous president. Not one word was ever mentioned about any closure so we feel like we’ve wasted a lot of time making sure we had the room reserved and now we have nothing. As of today, no one from the library has contacted us to let us know about these plans. Furthermore, I don’t think I need to get in my car and drive to a meeting to give input on what folks want as far as library services. Books! It’s quite simple. A fresh coat of paint (or whatever) is fine but in the middle of summer when kids are out of school? Ridiculous. Every single budget has been cut so the closure of the library at this time with no notice for a facelift (with god knows what money) is obnoxious at best. Gotsta spend grant money to makes grant money. That’s crap. How about using that money to open a neighborhood pool instead? I know, comparing apples & oranges. This is why I am always quick to dismiss anyone in Government/Politics, myself included. The Sacramento Public Library invites the community to celebrate the grand reopening of its Colonial Heights branch, 4799 Stockton Blvd., Sacramento, on Saturday, September 24 from 10:30 a.m. to 3 p.m. The library has been closed for two months to undergo modernization and improvements. The library is now brighter with an open floor plan and offers a large central reading and lounge area and more seating for laptop users. The library has created an expanded area for teens and offers three group study rooms. The new drop-in Homework Coach program for children will operate on Tuesdays and Thursdays from 3 p.m. to 5 p.m.
For more information, please telephone the Sacramento Public Library at (916) 264-2920 or visit http://www.saclibrary.org.